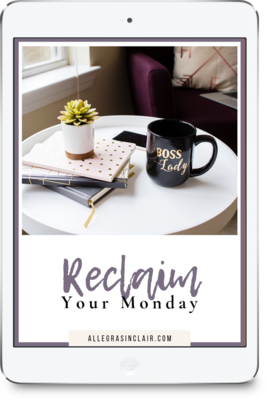 I help corporate women ​stop hating Mondays, ​take stock, and move toward ​work that lights them on fire. This coaching experience helps you realize how quickly you can reconnect with the big dreams you had when you were starting your career ​so your results become easier to achieve. Personalized attention to find and remove any blocks to being even more awesome, than you already are. ​I wanted help sorting out and balancing personal and professional needs and priorities to determine a course forward. The coaching helped me greatly in arriving at well-considered decisions. As a result I have made some life-changing decisions with very little of the attendant stress and second thoughts I have experienced in the past. Allegra is a great coach. She’s skilled at asking questions that lead to insights, and she’s positive and inspiring​. Aren't you tired of getting depressed every Sunday because you have to go back to work the next day? Sign up below to subscribe and learn to control your work week.